Well the summer is coming to a close, but despite the vacations, our team has been working hard to produce more great features in Handbid. Here is the latest batch of updates released just last week! Auction Sponsors now appear on the Events WebSite! Check out your Handbid events home page just above the map. There you will find a space where you can recognize your event sponsors! While you can have as many sponsors listed here as you want, we think you need to set a practical limit. 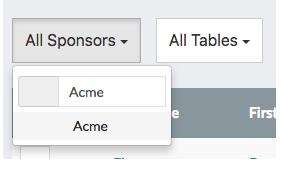 Adding sponsors is easy: open your auction settings and add them on the sponsors tab. Also, do you want to know how your sponsors are doing? Well Handbid will report on how many clicks each of your sponsor logos get right there in the auction manager.. Click here for more information on how to add your auction sponsors! Connect your Facebook ad campaigns to your events site with a Pixel. If you don’t know what a Facebook pixel is, you can read more about it here. Facebook pixels allow you to track conversions from your ads and gather information that can help you build better target audiences in the future. To do that, you need to have a pixel loaded on the web pages. This pixel will track user actions (e.g. register, purchase ticket) and send that data back to Facebook. This will show your ad managers how well your ad performed in driving event registrations and ticket sales. To make this easy, we now all you to set a Facebook Pixel ID in you auction settings. Click here for more information on this feature. So you love the smart invite links that Handbid generates for each invited guest, but you would rather process invites directly through your own list manager such as MailChimp or Constant Contact. We heard you. Now you can export your invite list as a CSV file and it will include the custom invite URL for each person in the list. Go ahead and import that into your list server and email away! Those links will still work just like they do from the Handbid invitation system. Need instructions on how to do this? Click here to get the details. You loved the bulk edit feature on the guest list, so we added it to the invite list. So “mass-edit” away! Here are details on this: Bulk edit invitees. Finally, for those of you with massive sponsor lists, we have added a search option to the dropdown so you can more easily find sponsors in your guest list! We hope you find these new updates helpful! We have a lot of exciting new features coming, so expect to hear from us again soon!